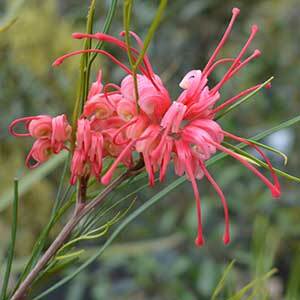 A very attractive species, Grevillea longistyla is grown for the graceful flowers from spring through to summer. Not only are the spidery flowers attractive, they also bring honeyeaters, bees and beneficial insects to the garden. The plants we mainly see are actually hybrids, Grevillea longistyla x johnsonii is the main variety. Use this as a feature plant in the garden, or plant them as hedging plants. Once established this is a very easy care plant. It does require a free draining soil an is best grown in full sun. Amend with well rotted compost and some aged cow manure. Generally not required, although a little tip pruning after flowering will help keep the plant bushy. Position – Best in full. Foliage – Mid to deep green and divided.